Wyoming started fall camp Monday morning at the North 40 practice fields on campus. As in the past, media was allowed to watch the first 30 minutes. Here are some video highlights from the morning. The Cowboys worked a lot of forcing and recovering fumbles early on. Forcing more turnovers is a must. Last season, UW forced just 10 turnovers (five fumbles and five interceptions). Jon Coppens’ interest in playing football for Craig Bohl goes back three years ago when he was in high school in Minnesota and Bohl was the coach at North Dakota State. Both Coppens and Bohl are in different places now, but figure to come together in the fall. 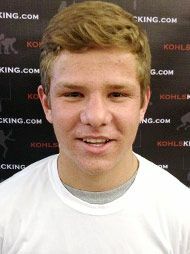 Coppens, a 6-1, 185-pound kicker from Nolan Catholic High in Fort Worth, Texas, committed to Wyoming Tuesday night. Coppens will be a preferred walk-on, but said Wednesday during a phone interview that he will receive a significant academic scholarship from UW as he pursues a degree in petroleum engineering. “Not only is Wyoming an affordable school, but the majority, if not all of (my schooling), will be paid for academically for me,” Coppens said. As a senior this season, Coppens made 8 of 10 field goals, with a long of 45 yards, and made all 25 of his extra-point attempts. He also handled kickoffs and did some punting. “I would say I’m equally good in all three areas, and can contribute at the Division I level in all three areas,” Coppens said. Once again, Wyoming started its ninth day and 11th practice of fall camp Tuesday with some 11-on-11 work as the team practiced in full pads. It was all passes by the offense, and it looked like the defense took a look at some different blitz packages. Senior cornerback DeAndre Jones had a good session. He broke up a deep pass from redshirt senior quarterback Colby Kirkegaard to sophomore receiver Tanner Gentry deep down the field. Later, Jones jarred the ball loose from sophomore receiver Jake Maulhardt on a short pass over the middle. The defense had the advantage over the offense for the most part, and it looked like at times the quarterbacks had issues with getting the play off before the play clock expired. Junior defensive end Eddie Yarbrough had two sacks — although quarterbacks were not allowed to be hit. Redshirt junior defensive tackle Troy Boyland had a sack, and senior defensive end Sonny Puletasi had an athletic pass break-up in pass coverage. Per usual, Kirkegaard and sophomore Tom Thornton were the only quarterbacks to take snaps during this period. All indications are that Kirkegaard still has a firm grasp of the starting job, and Thornton is the backup. UW mixed and matched a few offensive linemen in with the No. 1 offense at times. Sophomore Sam Hardy played some at guard and redshirt freshman Kurtis Stirneman played a few snaps at left tackle. Sophomore starter Nathan Leddige remains out with a concussion. Most of the snaps there went to junior Austin Traphagan. True freshman cornerback Robert Priester and true freshman safety Chavez Pownell Jr. got some reps with the No. 2 defense. Monday marked the eighth day of fall camp for Wyoming, and it will practice twice today. But there was some sad news as sophomore punter Ethan Wood will be away from the team for a while because his parents, John and Resia, died in a plane crash over the weekend in Iowa. According to UW’s Facebook page, the Woods’ were coming back from Michigan where they were visiting one of their other sons, Josh, who is an assistant football coach at Michigan Tech. Woods is from Colorado Springs, Colorado, and in his first season as UW’s punter last season — and his first punting the ball, period, he averaged 42 yards per punt. That prompted the return of senior kicker Stuart Williams to camp. Williams was not part of the first week of camp and the 105-man roster so first-year coach Craig Bohl and his staff could look at other guys. Bohl said it was good to have Williams back in camp, and added he made a 55-yard field goal at the end of practice. Williams is the only punter and kicker available in camp right now. Junior Justin Martin, Williams’ backup at kicker, is out with a sprained ankle. UW began practice with some 11-on-11 work. Redshirt senior quarterback Colby Kirkegaard — still the probable starter — threw completed a deep ball of 40 or 50 yards to sophomore receiver Tanner Gentry. Gentry later made a nice catch along the sideline. Sophomore cornerback Tim Hayes got drilled on a blitz after a nice block by redshirt sophomore running back D.J. May. Bohl said some new blitzes were introduced Monday, and he liked what he saw. He said it caused the offense some problems. Senior right tackle Connor Rains was with the No. 1 offense after missing some time with an injury last week. Sophomore left tackle Nathan Leddige (concussion) is still out, but was at practice watching. Junior Austin Traphagan ran with the No. 1 offense at left tackle. Wednesday was the first day Wyoming put on shoulder pads during fall camp, but its first full-padded practice isn’t until Friday. The most significant thing the media got to see during the first 30 minutes we are allowed to watch was work on the punt game. UW worked on a lot of different formations in both is punt and punt block teams. Senior linebacker Jordan Stanton blocked consecutive punts after junior Justin Martin replaced sophomore punter Ethan Wood. Sophomore tight end Jacob Hollister also blocked a punt working with the No. 2 team, and nearly blocked another, and senor linebacker Devyn Harris partially blocked one as well. Wood handled the majority of the punts. He had a few good kicks, and some not-so-good ones. UW’s pressure was pretty consistent, so that probably didn’t help matters for Wood. Guys who rotated in and out catching punts included redshirt junior running back D.J. May, senior receivers Dominic Rufran and Jalen Claiborne and redshirt junior cornerback Tyran Finley. Not many guys caught punts as most went out of bounds. The most positive aspect of Wyoming’s special teams from the spring was junior kicker Stuart Williams. In three scrimmages and the spring game, Williams made all 25 of his extra-point attempts and was 20 of 21 on field goals, with a long of 41. Williams also did a lot of kicking during practices, and was accurate then, too. His efforts earned him a scholarship starting this fall. Williams worked hard in the offseason, and it showed. The ball is getting off his foot faster and higher. I think he is most comfortable from 40 yards and in, but he has the leg to make field goals of up to 50 yards. The two field goals Williams missed were blocked. What also made his spring effort impressive was that UW didn’t have a consistent long snapper. Often times the snaps were low and slow, which can mess up the timing on kicks. The Cowboys are relying on true freshman Brendan Turelli to come in this fall and handle those duties. Wyoming true freshman walk-on kicker Justin Martin didn’t come to play football for the Cowboys just to handle kickoffs, but that’s what he’s doing. Listen to his interesting story during this interview held Monday, Sept. 24, 2012, and for more on his story see Wednesday’s Wyoming Tribune Eagle and Laramie Boomerang, or go to wyosports.net. Wyoming coach Dave Christensen stayed after practice to watch his kickers work on kickoff placement. He wasn’t happy with some of the placements by true freshman walk-on Justin Martin in last week’s game at No. 17 Texas — which dropped from No. 15 despite beating UW 37-17 last Saturday. Martin is still the starter going into Saturday’s home-opener against Toledo. But sophomore place-kicker Stuart Williams and redshirt freshman Zack Berg are also getting some reps. I’ve been told Berg has a big leg, but his accuracy still needs work. Sounds a lot like my golf game.